The historic, sprawling plantation estate at Gaylord's at Kilohana Plantation is the setting for our farm-to-table, four-course dinner menu, paired with exquisite wine chosen by Hawaii's very own Master Sommelier, Patrick Okubo. Patrick Okubo is one of the Hawaii's three resident Master Sommeliers, a prestigious title held only by 236 people in the world. Okubo, who served as a Sommelier at Formaggio, now works in wine education and sales for Young's Market, a national distributor of wine, beer and spirits. 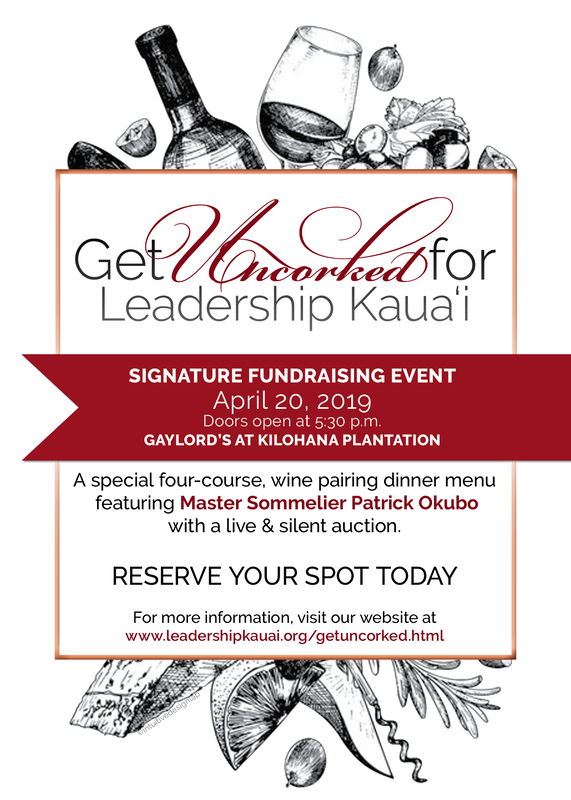 The evening includes a LIVE & SILENT Auction and the opportunity to network with community leaders and Leadership Kauaʻi Alumni. Don't miss out on this event! Seating is limited. Purchase your ticket above today. Ask about our Sponsorship Opportunities and VIP Tables. Interested in learning more about our upcoming event? Invest today in Kauai's Future Leaders!